The spiral structure around the red giant R Sculptoris allowed astronomers to study the history of pulses of mass from the star. An intriguing spiral structure surrounding a pulsing red giant star may be offering a preview of how the sun will behave at the end of its life. Using the Atacama Large Millimeter/Submillimeter Array (ALMA) in northern Chile, an international team of astronomers found the spiral structure, one never seen before, in the envelope of gas and dust around a red giant about 1,000 light-years from Earth and took a detailed three-dimensional reading of its composition. The spiral is thought to be created from the gases being expelled by the dying red giant called R Sculptoris. The structure provides information about the velocity of the wind blowing off of R Sculptoris, revealing that the star has expelled three times as much mass as previously estimated. Every 10,000 to 50,000 years, these gaseous behemoths burn helium for a few hundred years in a runaway process known as a thermal pulse, causing the layers of the star to mix. "Thermal elements are an essential part of late stellar evolution," Maercker told SPACE.com in an email. "They are responsible for the formation of new elements, which eventually will get incorporated into new stars and planets." These new elements take time to reach the outer layers of the star. By studying the corkscrewed expulsion from R Sculptoris, the astronomers calculated that the star was shedding more mass during thermal pulses than had been estimated. "This means that much more mass is lost during a time where new elements cannot yet be incorporated into the wind," Maercker said. "Hence it will take longer for these elements to be blown into space ― most likely, only during the next pulse." 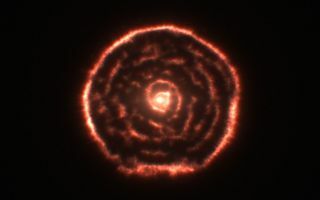 The spiral shape was caused by a companion star pushing through the layers expelled by T Sculptoris. The formation is allowing the scientists to study the history of the thermal pulses: Elements blown off at higher speeds create more widely separated spirals, while phases of slower mass loss are more tightly packed. The intensity of the spiral reveals how much mass was lost in each phase. "Now that the companion star causes the spiral structure in the stellar wind from R Sculptoris, we can see it and, in a very detailed way, measure how it has evolved since the last thermal pulse," Maercker said. The research was published in today's (Oct. 10) online version of the journal Nature. Located in the constellation Sculptor in the Southern Hemisphere, R Sculptoris is a typical red giant, so its evolution could provide a hint of what to expect from the sun down the road. ALMA is a new network of 66 radio dishes linked together to observe cooperatively. The facility won't be fully operational before next year; fewer than half of the telescopes in the array were functional when R Sculptoris was examined. Maercker and his team hope to use ALMA's full array to get an even closer look at R Sculptoris in the future. "We hope to see exactly where the spiral begins," he said. That information should reveal the mass and orbits of R Sculptoris and its companion star, providing more exact information about what happens to red giants during and after their thermal pulses. "This will allow us to understand late stellar evolution better, and where and how the material for new stars is created," Maercker said.